Homily in Loving Memory of Fr. Lionel A. Blain, Ph. D.
A man shall leave his father and his mother and be joined to his wife, and the two shall become one. That is the normal course of things for most people, to grow up and get married and raise a family. But from the time he was a child, Joseph Albert Lionel Blain felt called by God to a different type of marriage; he felt called to wed himself for life to the Bride of Christ, the Church, as a Catholic Priest. And so at the young age of about 13, Lionel Blain left his father Georges, and his mother Marie Rose, and he left his home town of Woonsocket, to go live at Our Lady of Providence High School and College Seminary on Warwick Neck, to begin his studies for the priesthood. After six years there, and two more years of college in Montreal, Nel then boarded a ship and sailed across the Atlantic Ocean to Rome; to live for the next four years at the newly Rebuilt Pontifical North American College for American Major Seminarians. He once mentioned to me that he was feeling very homesick when he got to Rome, when he walked into Ancora Bookstore next to St. Peter’s Square (which is still in business) and the first book he saw was “She wore a crown of thorns: The Life of Little Rose Ferron, Stigmatist of Woonsocket, RI”! He didn’t feel homesick after that. Nel had the privilege of leading the seminary choir when Pope Pius XII blessed the new seminary building on October 14, 1953. He did such a good job leading the choir that the seminary allowed him to skip a grade and get ordained a priest a year earlier than his classmates, on July 18 1954 at the Church of the Twelve Apostles in Rome. Only one of his family members, a sister, was able to attended his ordination and first Mass thanks to his pastor paying for her travel expenses, and only a few Rhode Islanders seminarians were there; the only one still living being Wifred Gregoire, now a senior priest living at St. Agatha’s down the road. Lionel Blain had received his life’s vocation, he had wed himself to God and to the Church, he had become a priest forever. And for the next sixty-one years, Fr. Blain remained faithful to the Bride of Christ, faithful to his calling a priest, ordained to bring Christ’s love and salvation to God’s people, faithfully serving where ever the Bishop sent him. Fr. Blain’s favorite philosophy was what is called Catholic Existentialism, which he studied from the famous 20th century philosopher Gabriel Marcel whom he personally met. Catholic Existentialism stresses how we can encounter God in every encounter we have with other people, and that the living God is found in the present moment; and I mention this because Fr. Blain had a real spark of life in him, and was able to connect very easily to people, whether one on one, or when at the pulpit before a congregation, so that you always left him feeling affirmed and loved by God. As one parishioner once told me when I first got here, Fr. Blain is “very fatherly.” What better complement can you give a priest than that?? In 1973 Fr. Blain was made the Pastor of St. John the Baptist in Pawtucket, and was given the job of merging that parish with another area parish; It wasn’t the easiest assignment from the little he told me of it, he laughing told me that in the end he had to un-merge the parishes as things didn’t work out so well. Fr. Blain even took failures like this in stride, not letting it get to him, which I think was great for me to see as a young priest. Finally in 1983, Father Blain was assigned to our parish of St. Joseph Woonsocket. Bishop Gelineau said “you have a six year term, then we will evaluate your performance as a Pastor, and maybe reassign you for six more years.” But lucky for us they forgot about him way up here in Woonsocket, and for 24 years until his retirement in 2007, Father Blain led the flock of St. Joseph’s as our pastor, celebrating thousands of Masses, hearing hundreds of confessions, doing hundreds of funerals, weddings, baptisms and first communions. A lot of people told me that when he first came here he was a bit strict and serious; but just like good wine which gets better with age, Fr. Blain mellowed out as the years went on. St. Paul in the Second Reading says Husbands, love your wives. And Fr. Blain truly loved this parish which he was wedded to. One of the number one things a husband and father wishes to give his family is a beautiful house to live in, and to feel at home in. Father Blain also had that desire for his family, our parish. And so in the early 1990s, Father Blain embarked on a massive undertaking, the total renovation and expansion of our parish. This beautiful Church building we are proud to call our home today is due in large part to Father Blain’s vision and leadership. The renovation committee voted to name the renovated Church Hall the Fr. Blain Hall. “I’m a living institution!” Fr. Blain would say. But as concerned as he was about giving the Lord and His people a good home to worship in, Fr. Blain was just as concerned about giving the poor and homeless of Woonsocket a home to live in as well. He was one of the founding members of the Woonsocket homeless shelter, and spent many of his 24 years here being an advocate for the poor of our area. 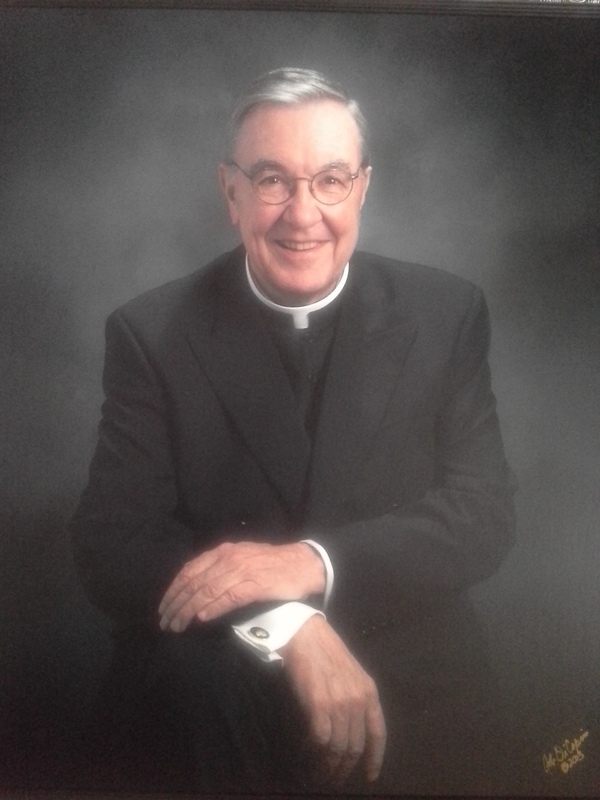 I could go on and on, but I will just end by saying thank you, Father Blain, for being a good, holy and faithful priest, friend and spiritual mentor to the end, and for all the love and service you gave to our parish for 24 years and to our diocese for 61 years. The Lord came to take you home on the Feast of Mary, Queen of Heaven and Earth, August 22. May Mary, the Queen of Heaven, Mother of Priests, and St. Joseph our Patron, obtain pardon for your sins and receive you into Heaven to be reunited with your parents and all your family and friends that have gone before you in faith. This entry was posted on Monday, August 24th, 2015 at 11:17 am and is filed under Uncategorized. You can follow any responses to this entry through the RSS 2.0 feed. Both comments and pings are currently closed.